Pedicularis rhinanthoides ssp. labellata, from here. Contains: Pedicularis section Phanerantha, Pedicularis section Nothosigmantha. 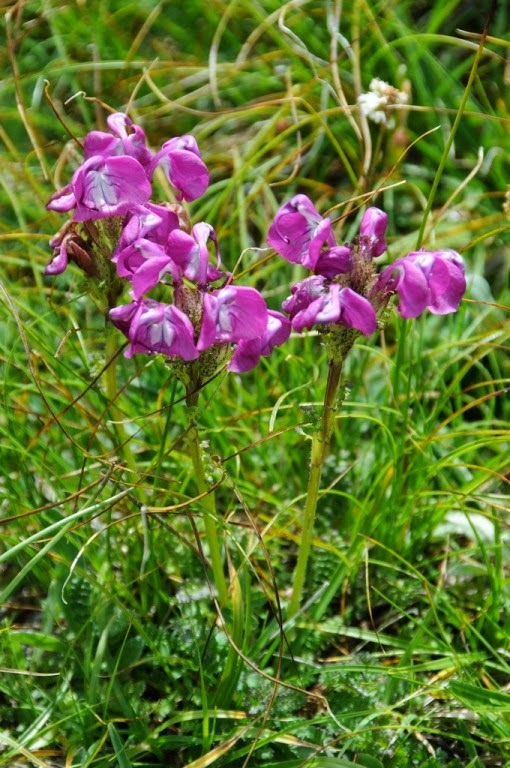 Pedicularis, louseworts, are a genus of hemiparasitic herbs with hooded flowers. Characters (from Flora of China): Herbs perennial or annual, rarely biennial, hemiparasitic. Leaves alternate, opposite, or whorled, usually pinnatifid to 1- or 2-pinnatisect, rarely entire or dentate. Lower leaves usually long petiolate; upper leaves often more or less sessile. Inflorescences terminal or flowers axillary; bracts usually leaflike. Calyx tubular to campanulate, often more or less bilabiate, usually deeply cleft anteriorly, (2-)5-lobed. Corolla purple, red, yellow, or white, strongly bilabiate; upper lip (galea) hooded, enclosing anthers, laterally compressed, rounded or truncate, or terminating in teeth or in a beak; lower lip 3-lobed, usually spreading, external to upper lip in bud. Stamens 4, didynamous; filaments glabrous or pubescent; anthers mucronate or not. Stigma capitate. Capsule moderately compressed or not, loculicidal. Seeds numerous, reticulate or costate. [C55a] Candolle, A. de. 1855a. Géographie Botanique Raisonée: Ou exposition des faits principaux et des lois concernant la distribution géographique des plantes de l’époque actuelle vol. 1. Librairie de Victor Masson: Paris. [C55b] Candolle, A. de. 1855b. Géographie Botanique Raisonée: Ou exposition des faits principaux et des lois concernant la distribution géographique des plantes de l’époque actuelle vol. 2. Librairie de Victor Masson: Paris. [OP01] Olmstead, R. G., C. W. dePamphilis, A. D. Wolfe, N. D. Young, W. J. Elisons & P. A. Reeves. 2001. Disintegration of the Scrophulariaceae. American Journal of Botany 88 (2): 348-361. [Y88] Yamazaki, T. 1988. 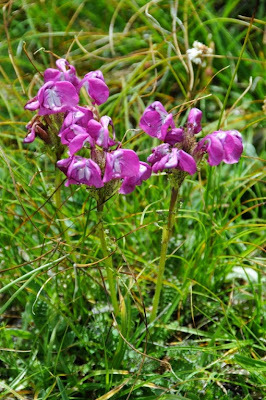 A revision of the genus Pedicularis in Nepal. In The Himalayan Plants vol. 1 (H. Ohba & S. B. Malla, eds) The University Museum, University of Tokyo, Bulletin 31: 91-161.